When we think of cordage we most often think of rope or paracord. A visit to a hardware store or possibly the hardware section of a super store will provide all manner of cordage, both natural and synthetic. 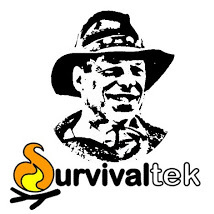 It’s good to include some type of cordage in your “Go-Bag”, back-pack, or car’s emergency supplies. On the bushcraft side of life, cordage can be made in the field from a variety of fibrous materials. Plants such as nettles, dogbane, milkweed, thistle, grass, and more provide fiber that can be twisted by hand into strands of cordage. Using fibers can often take time to prepare but there is perhaps a quicker resource for binding material – sapling roots. A sapling is defined as a young tree, especially one with a slender trunk. 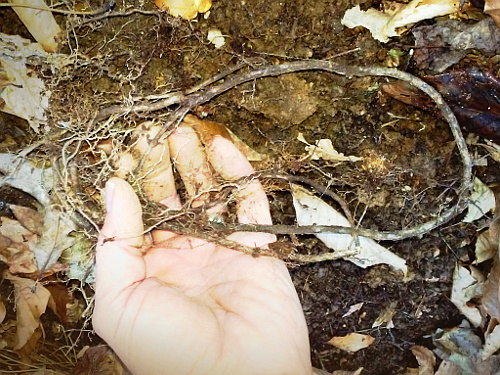 They send out roots that are close to the surface of the ground that can grow to several feet in length. In addition, they are very flexible and quite strong. The root in the photo was collected from a sapling at the edge of the woods behind my home. The ground is covered by leaves and very moist from recent rains. I used a gardening hand cultivator to dig up the soil to reveal and retrieve the root but a digging stick or even just your hands can accomplish the same task. This root was just an inch or so below the surface and about three feet long but other roots could easily be longer. Care should be taken to uncover these as much as possible rather than just pulling it free to preserve their length which will make them much more serviceable for binding. The tripod in the photo was lashed together using this single root and was very serviceable. 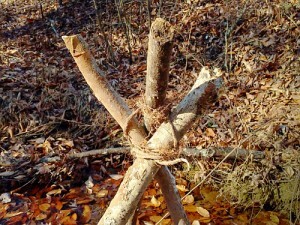 Additional roots could be used to further strengthen it if needed or to hang a pot over a campfire for cooking. 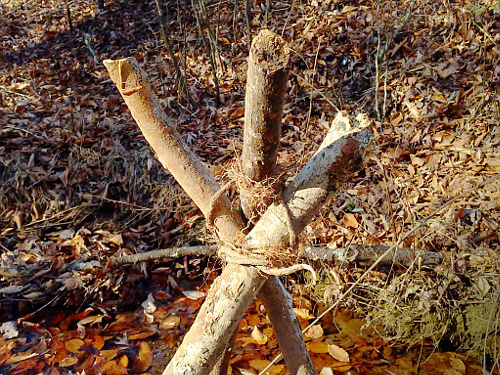 In any case, it took very little effort to collect the root and assemble the tripod in a short amount of time. This entry was tagged Cordage, Knots, Lashing, Root, Roots, Tripod. Bookmark the permalink.